Fio. 7.9. Types of agitators: (a) dise turbine; (b) vaned dise; (c) open turbine, variable pitch; (d) marine propeller (Solomons, 1969). the blades of a marine propeller are attached directly to a boss on the agitator shaft. In this case the air bubbles do not initially hit any surface before dispersion by the vanes or blades. Four other modern agitator developments, the Scaba 6SRGT, the Prochem Maxflo T, the Lightning A315 and the Ekato Intermig (Figs 7.10 and 7.11), which are derived from open turbines, will also be discussed for energy conservation and use in high-viscosity broths. Fig. 7.10. 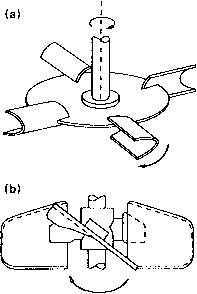 Diagrams of (a) Scaba agitator; (b) Lightnin' A315 agitator (four blades) and (c) Prochem Maxflo T agitator (four, five or six blades) (Nienow, 1990). ric air flow rate/cross-sectional area of fermenter) exceeds 21 m h"1, whereas the flat blade turbine can tolerate a Vs of up to 120 m h 1 before being flooded, when two sets are used on the same shaft. Besides being flooded at a lower Vs than the disc turbine, the propeller is also less efficient in breaking up a stream of air bubbles and the flow it produces is axial rather than radial (Cooper et al., 1944). The disc turbine was thought to be essential for forcing the sparged air into the agitator tip zone where bubble break up would occur. Fig. 7.11. Arrangement for a pair of Intermig agitators. Relative dimensions are given as a proportion of the fermenter vessel diameter (T) (Nienow, 1990). provided the agitator speed is high enough, good gas dispersion will occur in low-viscosity broths (Smith, 1985). It has been also shown that similar oxygen-transfer efficiencies are obtained at the same power input per unit volume, regardless of the agitator type. In high-viscosity broths, gas dispersion also occurs from gas filled cavities trailing behind the rotating blades, but this is not sufficient to ensure satisfactory bulk blending of all the vessel contents. When the cavities are of maximum size, the impeller appears to be rotating in a pocket of gas from which little actual dispersion occurs into the rest of the vessel (Nienow and Ulbrecht, 1985). Recently, a number of agitators have been developed to overcome problems associated with efficient bulk blending in high-viscosity fermentations (Figs 7.10 and 7.11). The Scaba 6SRGT agitator is one which, at a given power input, can handle a high air flow rate before flooding (Nienow, 1992). This radial-flow agitator is also better for bulk blending than a Rushton turbine, but does not give good top to bottom blending in a large fermenter which leads to lower concentra tions of oxygen in broth away from the agitators and higher concentrations of nutrients, acid or alkali or antifoam near to the feed points. Another is the Prochem Maxflo agitator. It consists of four, five or six hydrofoil blades set at a critical angle on a central hollow hub (Gbewonyo et al., 1986; Buckland et al., 1988). A high hydrodynamic thrust is created during rotation, increasing the downwards pumping capacity of the blades. This design minimizes the drag forces associated with rotation of the agitator such that the energy losses due to drag are low. This leads to a low power number. The recommended agitator to vessel diameter ratio is greater than 0.4. When the agitator was used with a 800-dm3 Streptomyces fermentation, the maximum power requirement at the most viscous stage was about 66% of that with Rushton turbines. The fall in power was also less in a 14,000-dm3 fermentation. The oxygen-transfer efficiency was also significantly improved. It was thought that an improvement in bulk mixing was another contributing factor. 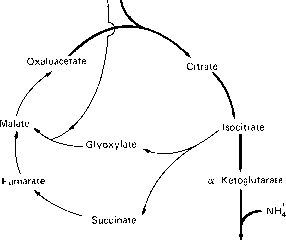 Intermig agitators (Fig. 7.11) made by Ekato of Germany are more complex in design. Two units are used (with agitator diameter to vessel diameter ratios of 0.6 to 0.7) instead of a single Rushton turbine because their power number is so low (Nienow, 1992). 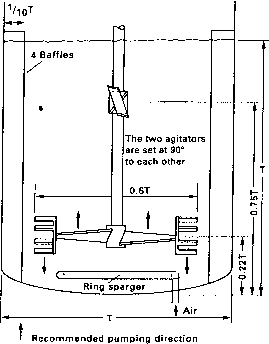 A large-diameter air sparger is used to optimize air dispersion (see later section on spargers). The loss in power is less than when aerating with a Rushton turbine. Air dispersion starts from the air cavities which form on the wing tips of the agitator blades. In spite of the downwards pumping direction of the wings, the cavities extend horizontally from the back of the agitator blades, reducing the effectiveness of top to bottom mixing in a vessel. Cooke et al. (1988) and Nienow (1990, 1992) give comparisons of performance of Rushton turbines with some of the newer designs. These new turbine designs make it possible to replace Rushton turbines by larger low power agitators which do not lose as much power when aerated, arc able to handle higher air volumes without flooding and give better bulk blending and heat transfer characteristics in more viscous media (Nienow, 1990). However, there can be mechanical problems which are mostly of a vibrational nature. Good mixing and aeration in high viscosity broths may also be achieved by a dual impeller combination, where the lower impeller acts as the gas disperser and the upper impeller acts primarily as a device for aiding circulation of vessel contents. This has been discussed by Nienow and Ulbrecht (1985) and in Chapter 9. Steel and Maxon (1966) tested a multi-rod mixing impeller. In a 15,000-dm3 vessel, the same novobiocin yield and oxygen availability rate were obtained at about half of the power required by a standard turbine-stirred fermenter, but this type of impeller does not appear to have come into general use. The satisfactory sealing of the stirrer shaft assembly has been one of the most difficult problems to overcome in the construction of fermentation equipment which can be operated aseptically for long periods. A number of different designs have been developed to obtain aseptic seals. The stirrer shaft can enter the vessel from the top, side (Richards, 1968) or bottom of the vessel. Top entry is most commonly used, but bottom entry may be advantageous if more space is needed on the top plate for entry ports, and the shorter shaft permits higher stirrer speeds to be used by eliminating the problem of the shaft whipping at high speeds. Originally, bottom entry stirrers were considered undesirable as the bearings would be submerged. Chain et al. (1952) successfully operated vessels of this type, and they have since been used by many other workers. Mechanical seals can be used for bottom entry provided that they are routinely maintained and replaced at recommended intervals (Leaver and Hambleton, 1992). One of the earliest stirrer seals described was that used by Rivett, Johnson and Peterson (1950) in a laboratory fermenter (Fig. 7.12). A porous bronze bearing for a 13-mm shaft was fitted in the centre of the fermenter top and another in a yoke directly above it. The bearings were pressed into steel housings, which screwed into position in the yoke and the fermenter top. The lower bearing and housing were covered with a skirt-like shield having a 6.5 mm overhang which rotated with the shaft and prevented air-borne contaminants from settling on the bearing and working their way through it into the fermenter. Fig. 7.12. A simple stirrer seal based on a description given by Rivett et al. (1950). which are also quite expensive, are being used in some animal cell culture vessels. 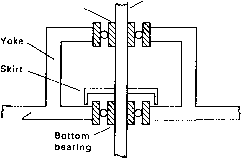 The stuffing box (Fig. 7.13) has been described by Chain et al. (1954). The shaft is sealed by several layers of packing rings of asbestos or cotton yarn, pressed against the shaft by a gland follower. At high stirrer speeds the packing wears quickly and excessive pressure may be needed to ensure tightness of fit. The packing may be difficult to sterilize properly because of unsatisfactory heat penetration and it is necessary to check and replace the packing rings regularly. Parker (1950) described a split stuffing box with a lantern ring. Steam under pressure was continually fed into it. Chain et al. (1954) used two stuffing boxes on the agitator shaft with a space in between kept filled with steam. Although, at one time, stuffing box-bearings were commonly used in large-scale vessels, operational problems, particularly contamination, have led to their replacement by mechanical seal bearings for many processes. However, these seals are sufficient for the requirements of GILSP containment (Werner, 1992).